Brian Austin Green has won this year’s Toyota Pro/Celebrity Charity Race at the the Long Beach Grand Prix, finishing fractions of a second in front of Adrien Brody and Zachary Levi. The celebrity race has been held every year since 1977, and has attracted stars such as Gene Hackman, Jason Bateman, Rick Schroder, Stephen Baldwin, Donny Osmond, Sean Patrick Flanery, Nancy Lieberman, Daniel Goddard and Josh Brolin. 2008’s race was won by ESPN/ABC pit reporter for NASCAR Nationwide Jamie Little, while last year’s race was taken out by Keanu Reeves. Reeves took part this year as well, but finished 11th, ahead of Christian Slater and Tony Hawk. Every year, Toyota donates $5,000 to Racing for Kids, a non-profit program benefiting children’s hospitals in Southern California, in the name of each celebrity racer, and another $5,000 to the winner’s charity of choice. The car company has donated close to $1.6 million to various children’s organizations since 1991. 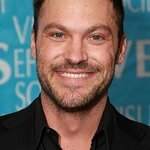 Brian Austin Green was featured earlier this month on LookToTheStars.org when he joined girlfriend Megan Fox in a video aimed at blocking the nearly $2.5 billion in proposed education cuts from the California state budget.